TUCSON, Ariz. — When we talk about gut and colon health, the discussion about probiotics isn’t far behind. Probotics have become so popular that it’s marketed in foods, capsules and even beauty products. Probiotics are the good bacteria found in our colons. We generate them naturally but can also ingest them through eating certain foods, and now through supplements. Four different types of over-the-counter probiotics at Walgreens each cost more than $20. 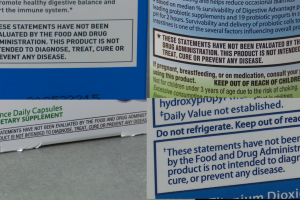 Taking in more probiotics may improve your gut health, but Dr. Juanita Merchant with Banner University Medical Center said the issue is that probotics aren’t tightly regulated by the Food and Drug Administration, and may do more harm than good if taken necessarily. “Well it’s not really clear that more is better, that’s why taking probiotics in food is preferable because your body really knows how to handle the bacterial load in general. But what may be packaged in a pill form isn’t necessarily going to be of the right dosage your body may want to handle,” said Merchant. If your gut is healthy, your body should produce what you need. But if your GI tract is a bit abnormal, Merchant suggests first starting simple. Probiotics are naturally found in foods like yogurt. “So even I would recommend that as a start if someone has been on antibiotics and they develop diarrhea — so a suggestion would be to reset their microbial flora in their colon by taking yogurt,” said Merchant. Microbial flora is the community of bacteria that exists in the body and help our intestinal functions. Overgrowth of this bacteria can lead to intestinal failure. “The pharmaceuticals companies have probably picked different bacterial strains or families of bacteria that they’ve seen in the literature, and have not really been tested in actual trials. And so they’re really guesstimating what may really work. And in many instances they don’t work at all. And you’re spending a lot of money on these pill form generated probiotics and its not really clear that it works,” said Merchant. Going back to the brands picked up at Walgreens, all four different brands were not tested with the FDA. Merchant’s recommendation: start out with yogurt, but not all yogurt is the same. “I would say, go with the Greek yogurts,” said Merchant. Some brands won’t yield the same results as Greek yogurt because it doesn’t have as high of a concentration of the good bacteria. “The more commercial American brands that have a lot of sugar in it, they don’t quite have, I think, the same – they don’t pack the same punch. I’ll put it that way,” said Merchant. If yogurt isn’t strong enough for you, a doctor can then prescribe you a clinically tested medical-grade supplement. Merchant said instead of hurting your gut, and your wallet, it’s a better bet to go with foods and by doctor recommendation to increase your probiotic intake.